I’m doing the 10×10 spring remix hosted by Un-Fancy and StyleBee. All this work week and next, I’ll be using 10 pieces of clothing to create 10 different outfits, using self-imposed limitations to spark some creativity. All the details – and the clothes (all thrifted)– here. 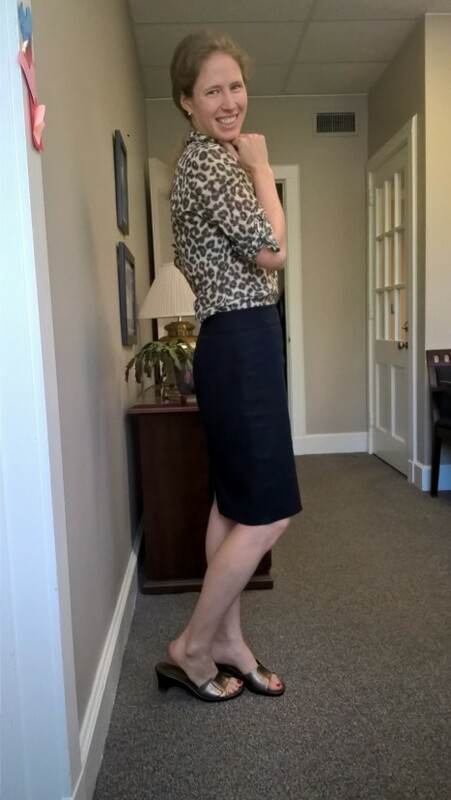 The blouse is Banana Republic Heritage, the skirt is J. Crew, and the slides are Bandolino. Everything but the jewelry (heirlooms) is thrifted. Forgot to put on my cuff this morning but if I had remembered it would be in there too! Styling notes: I rolled up those tabs to keep the sleeves outta my way (same as yesterday) and pinned the shirt closed in the front because the buttons are so small relative to the holes that they spontaneously undo themselves. Hopefully you can’t even tell. Thoughts: I hesitated on this combo because the navy and dark grey/taupe combo seemed too dark. I think I prefer this skirt with lighter/brighter tops, but I was actually pleasantly surprised that this didn’t look overwhelming. I think my pasty legs balance it out, ha! 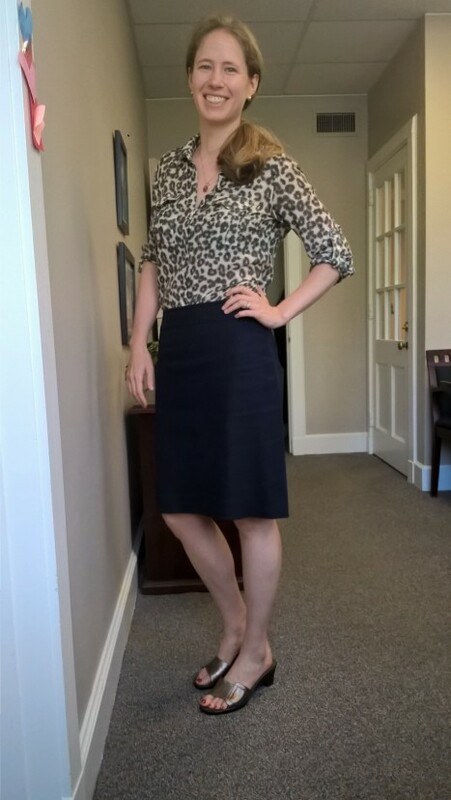 So far I’ve really enjoyed this remix and the challenge to take daily outfit pics (at least on work days). What have you thought of the mix (either yours or mine) – too much same-same, or more like hitting a groove? Next week (Tuesday & Wednesday) I’ll be back with outfits 9 & 10. In the meantime have a great weekend! You look fantastic in this look – very chic! Not that its a contest but I prefer this skirt with the blouse. Also, I think your legs look lovely!